Off the bat let me first say that I have only encountered this LP once in my life, and that copy was a white-label promo that I found in the collection of Ann Arbor record collector extrordinaire Dr. Arwulf Arwulf. Fortunately I had the presence of mind to make a copy, but I don't have the liner notes so any information re: this unsung classic comes mainly from memory or is pure guesswork. * I am reasonably sure that the label was Mercury however, the gang wot also gave us Sir Lord Baltimore, Uriah Heep and Rush. 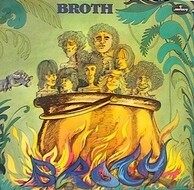 Based on the band photo and surnames of the members, it seems BROTH was a bunch of Nuyorican hippy types. As I recall the cover featured a cartoon of the band, a bunch of dudes with big afros and bell bottoms. Their sound can best be described as luddite Santana Band if Senor Carlos had been replaced by a Tony Iommi or Mark Farner type. The album kicks off with "I'm A King" which begins with a brief free-jazz interlude whilst singer intones "you will seeeeeee . . . that I-I-I-I-I . . . . ammmm uh-uhhhhhh . . . KIIIING!!" then the army of conga players start their bashing frenzy along with a primordial heavy funk riff. The tune last 6 minutes going thru several dynamic changes (loud and fast, slower and quieter, with breakdowns for psychedelic "oooooo" vocalizations and some nice Farnerish chukka-chukka guitar sounds.) Pretty much the pinnacle of the album, though certainly not the only standout track. Next up is "Manana (Sun Shine On)" which is a rather neat combo of chicken scratch guitar, vaguely countryish melodies and stoned harmonizing "Suuuuuuuuun . . . SHINE ON!" Third track is another winner, "Train Woman", beginning with some Shaft-style phased drums and featuring a gitar riff vaguely reminiscent of Sab's "Supernaut" (a song which also lifted some riffs from "Theme From Shaft" -- hmmmmm.) Also a treat are the goofy lyrics: "shake me break me rattle my brain, woman oh woman you drive me insane" and so on in the best Lord Baltimore tradition. The out-of-tune harmonizing on the chorus is also a hoot. Track four "Back To The City" has more of that nice chukka-chukka guitar, though it is kinda sub-T. Rex simple and again the harmonizing is far from tuneful. Track five "I'm Gonna Get You" has a nice heavy guitar sound but on the whole sounds like a retread of "Sun Shine On." Side two continues to drop off in quality with a none-too-necessary version of "Louie Louie" (only redeeming feature is some mumbling in spanish on the intro -- they also changed the lyrics but didn't make 'em any better than the original.) Also a street corner conga sing-a-long called "Here Comes The Man" and three dippy midtempo hippy pseudo-country-rockers, "She's Famous", "Change Your Mind" and "Goin' To Denver." On the whole, the precipitous decline from cookin' heavy salsa-metal in the first three songs into the snoozy sixties-isms on side 2 makes me suspect that this album may never have been "officially released" -- just a few promo copies sent out to judge the level of interest, which no doubt there was very little. I mean, the group "harmonizing" is no better than what you and five or six of your stoned friends could do and they were obviously struggling to find enough material to fill out a whole LP. But if the early 70's post-psych/proto-metal thang is your bag, then this is certainly a record you should keep an eye out for. I mean, who else was blasting out the sludge over a wall of congas, back then or ever since?